Super Space Invader is an action-packed arcade shooter created in under 48 hours for Ludum Dare 34. 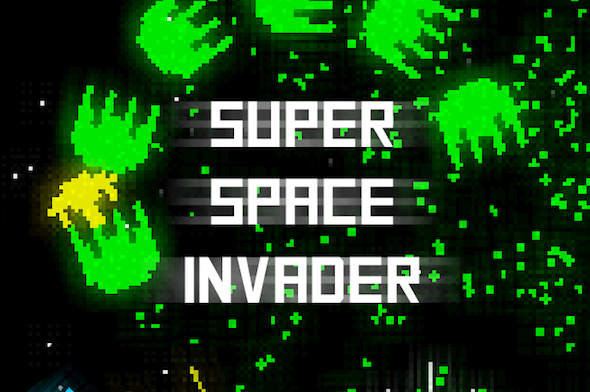 It combines space invaders, bullet hell, some Vlambeer, and other influences. You can plough through 13 waves, choosing from 13 ship upgrades after completing each one, or skip straight to the last (infinite) wave with a fully upgraded ship in sandbox mode. Keeping with the theme of two-button controls, there are only two buttons: left and right. Hold both together to confirm menu item selection (or just press enter if that's proving difficult). Tap both together to toggle the shield (available after a couple waves). LÖVE 0.9.2 - The game engine. Ammo - Framework for LÖVE. HardonCollider - Collision detection library. Sublime Text 3 - Text editor. Logic Pro X - Audio composition program, used for music and vocal effects.